Alien Explorations: Salvador Dali's "Napoleon’s Nose, Transformed into a Pregnant Woman, Strolling His Shadow with Melancholia amongst Original Ruins" references Edward Burne-Jones' "Perseus The Doom Fulfilled" ? 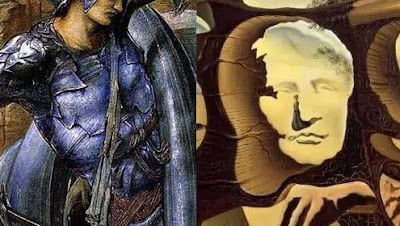 Salvador Dali's "Napoleon’s Nose, Transformed into a Pregnant Woman, Strolling His Shadow with Melancholia amongst Original Ruins" references Edward Burne-Jones' "Perseus The Doom Fulfilled" ? 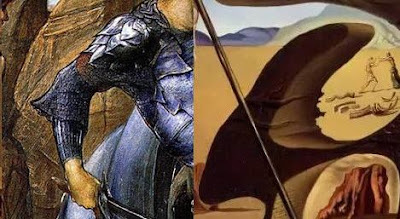 a) The Dali painting referenced Edward Burne-Jones' "Perseus: The Doom Fulfilled"? b) The upper torso of Perseus becomes transformed into an empty space in the central soft structure and becomes transformed into a vision of Napoleon's face. Perseus' bag strap also becomes the shadow to the left of Napoleon's nose that transforms into a woman stand up, while the belt becomes the bottom of the nose. c) The left arm of Perseus becomes transformed into a diagonal piece slanting down to the left on the far left of the central structure has. 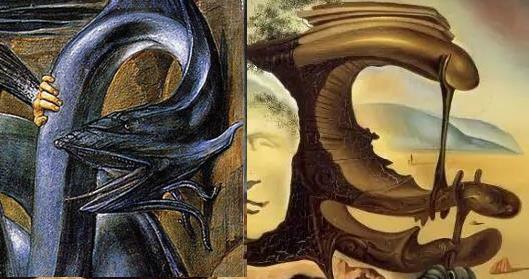 d) The sea serpents tail on the upper left becomes transformed into the finger like structure sticking out on the upper left. e) The serpents neck becomes transformed into a phallic structure on the upper right of the central structure and is supported by a crutch. It's mouth becomes the two soft phallic appendage sticking out below.